For readers of Judy Nunn's Spirits of the Ghan… When a newcomer blows into the mining town of Kalgoorlie she unwittingly uncovers a web of lies and a heartbreaking tie with her tumultuous past in this compelling family saga where the personal and political collide. As she strengthens her ties with the local community – especially with the vibrant Lori, stoical Kerry and wise Agnes – she finds herself questioning earlier decisions. 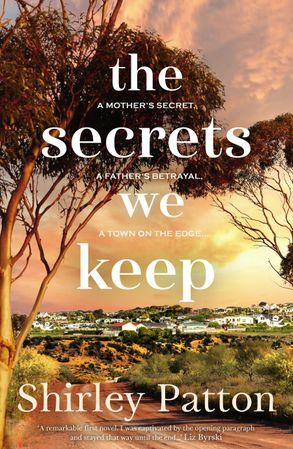 Can Aimee reveal her secret, even if it is not hers alone to share? Dr Shirley Patton grew up in outback Western Australia and now lives with her partner, and a miniature schnauzer, in wine-growing country overlooking the beautiful Tamar River, Northern Tasmania. A decade ago, she left an academic career as a published researcher of family violence, and a lecturer in the Dept. of Sociology & Social Work at the University of Tasmania, to write fiction full time. Since then, she has obtained a Masters of Creative Writing, and has published several short stories in a variety of literary publications. Prior to practising social work, Shirley worked in the media as a television newsreader and television chat show host. To find out more, visit Shirley on her website and follow her on Facebook.